Girard-Perregaux has revisited its Hawk Collection in the shape of the Sea Hawk diver's watch, a watch which traces its heritage back to the Second World War, and the Chrono Hawk. Water-resistant to 1000 m, the new Sea Hawk, which was debuted in Miami a couple of days ago, has a 44mm steel case with a helium escape valve. The bezel, case ring and crown are coated in rubber. The watch will retail for US$11,350. The new cases have a masculine, strong octagonal sculptured look and have definitely taken design cues from the Laureato and Sea Hawk lines - and also borrowed perhaps a little inspiration from Audemars Piguet's Royal Oak along the way. The new Sea Hawk is water resistant to 1000m (3300 feet) which meets the ISO 6425 Standard for diving watches. It features a helium escape valve to equalise pressure following a deep dive and an anticlockwise unidirectional bezel, so that divetime is not accidentally extended. 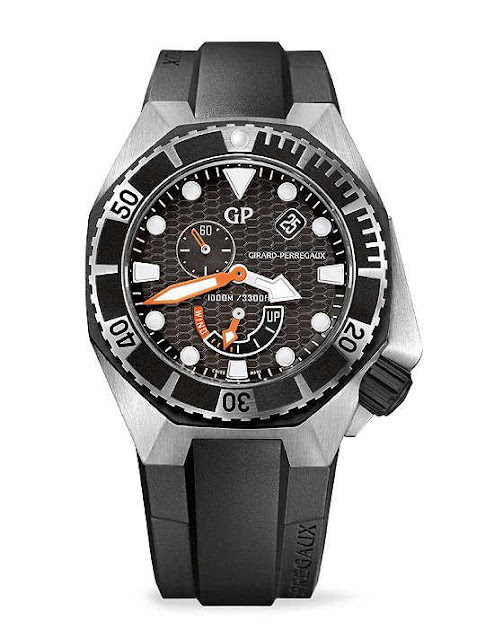 Designed for deep scuba diving, there’s an anti-clockwise turning bezel for dive time calculations. The watch features a brushed 316L stainless steel case which protects the large rubber crown and a rubber bezel on an octagonal ring insert. As one would expect, legibility is excellent on the black dial and the orange accents on the hands achieve terrific stand out. The hour indices are filled with SuperLuminova, as are the hands. Anti-reflective sapphire crystal makes for high visibility in all lighting conditions. The addition of power reserve, sub-seconds and a date make it a very practical watch. As with many dive watches, the crown is positioned at 4 o’clock with an integrated crown guard instead of three so as to make it easier to adjust. Also just released is the the Chrono Hawk. The family resemblance of strong, chunky angular casing is striking. For this model the bezel is brushed satin-finished steel and the watch features integrated chronograph pushers. 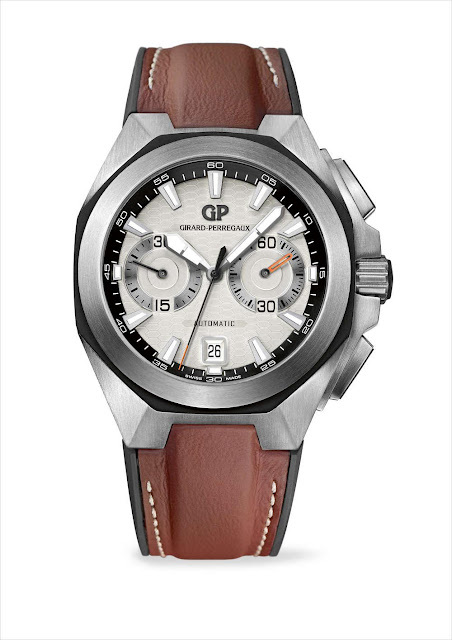 The watch is powered by the calibre GP3300-0073 with chronograph module, 28,800vph, PR 46h, 61 jewels. As expected there’s a sapphire display back, and the watch is water resistant to a respectable 100m. The automatic winding weight is shaped like an arrow and the solid shape compliments the case as well. The two chronograph counters face each other at 3 and 9 o’clock in perfect symmetry. The date at 6 o’clock, the applied markers, and the hour and minute hands are all luminescent. There are black dialled and white dialled versions; the lighter dial coming on a rubber lined crocodile strap.